Nerve Impingement and pain, limited range of motion or sharp pains in the shoulder can stem from weak muscle groups. Because many shoulder conditions present with similar symptoms, it is important to make an accurate diagnosis so that appropriate treatment can be directed at the cause. 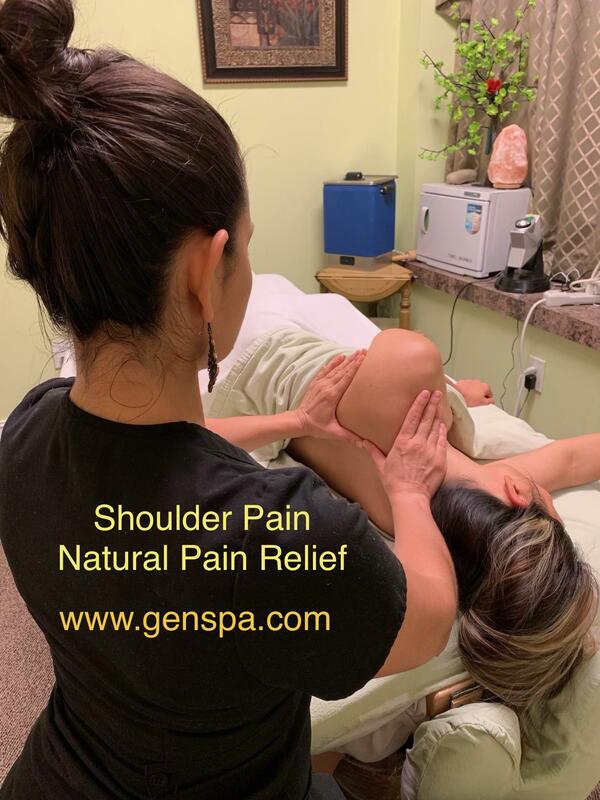 Gen Spa providers are experts at treating the specific points and treating the root cause of your pain, in most cases fully resolving the pain in as few as three visits (based on patient-reported outcomes). While traditional treatment focuses on rest and restricted activity, significantly reduces recovery time. But Gen Spa techniques increases the range of motion and flexibility, and keeps patients active and moving during and after treatment- so you never have to stop doing what you love. WHAT ARE THE SYMPTOMS OF A SHOULDER INJURY? Typically require long periods of rest, from heavy weight lifting and healing may take up to 8 weeks. Depending on the person.